The traditional seasons you read about in books seem to work a little differently in California than most places in the US. Sometimes it seems like summer lasts most of the year or that multiple seasons are happening simultaneously! This February definitely feels like the latter, with wintery snow on Mt Diablo and the first signs of spring blossoms showing up at the same time. 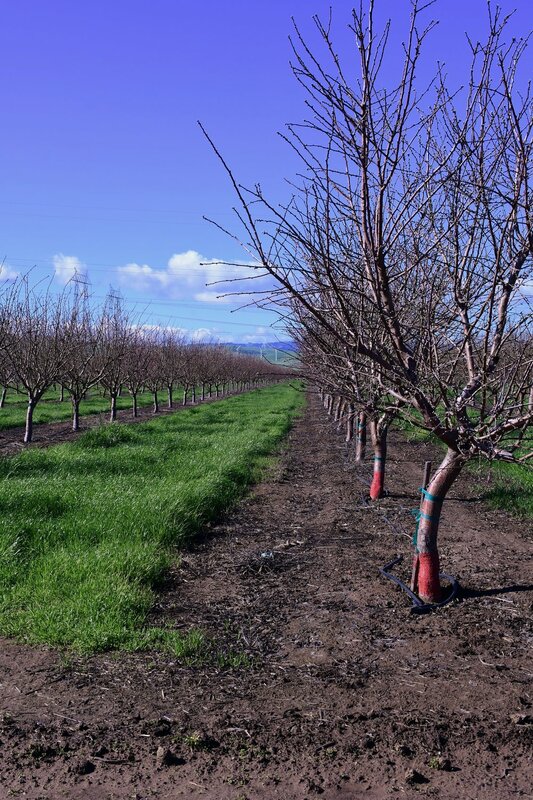 Last week we took advantage of a break in the rain to check in on some of our newer orchards and fields. Our young almonds are getting ready to bloom. Byron is the little town just southeast of Brentwood and also has the distinction of being home to Frog Hollow Farm staff’s favorite lunch spot, Taqueria Diaz. This historic railroad town is surrounded by agriculture, from vegetable crops to almond orchards. Last year we planted 2,665 Independence almond trees, a self pollinating variety, on 20 acres in Byron. Since these trees were just planted last March and we don’t expect to start harvesting until 2021 we are letting them focus on getting established. For now we are putting a lot of effort into improving the soil and making sure to establish a healthy ecosystem to support them as they grow. As we romped around in the orchard it was amazing to see such vigorous green growth of our cover crop which is already knee high. Since this land had been fallow before we planted, the soil was high in organic matter and carbon, which is a great starting point. As you might remember from previous CSA newsletters we have been working very hard on cover cropping this orchard with the help of Project Apis m., which provides custom pollinator friendly cover crop mixes to support bee populations. Providing a rich diet of pollen from this mix of various types of mustards, daikon radish, canola will “anchor” the local bee population to the orchard so that when our almonds have their relatively short bloom the bees will be there to enjoy it and make sure our trees set a healthy crop. In a few rows we also have a wildflower mix of goldfields, alyssum, yarrow, five spot, birds eyes, globe gilia, CA poppy, lacey phacelia, wallflowers, dames rocket, chinese forget me not, sweet mignonette, bachelor buttons, baby's breath. Additionally we saw some other volunteer plants growing as well including chickweed, stinging nettles (ouch!) and California native Miner’s Lettuce. Miner’s Lettuce is popping up all over the bay are right now and provided us with a delicious morning snack. 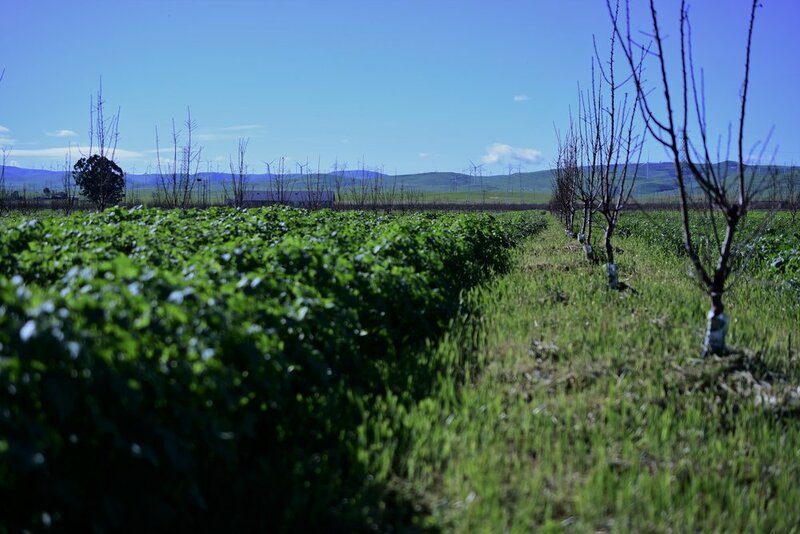 The greenery of our orchard is a major contrast to the the conventional almond orchards nearby, which are managed using herbicides to keep cover crops (also known as weeds) at bay. We believe strongly in cover crops not only for pollination but also as a living mulch to retain moisture and develop soil health with nitrogen fixers like clover. Our organic almond orchard with cover crop. The last thing to check out in the Byron orchard was to see if there was any activity in the owl box. We received a grant from the NRCS to put these boxes up to attract owls to manage gophers who love eating young tree roots. Not wanting to disturb our nocturnal friends we looked around the base of the support pole for owl pellets, which are made of *ehem* regurgitated leftovers. Rachel has developed quite the eye for spotting pellets and quickly found some containing gopher bones. While the circle of life can be a brutal reality, we much prefer to manage pests in natural ways than with chemicals. Our next project is adding a raptor perch for hawks to use as a hunting launch pad. We’re so happy to have the help of our avian pest control team. Our next stop was to check in on our Sonora Wheat. As you remember we got it in the ground just before the rains when it would have been too wet to plant. It is always a little stressful to get the timing right but things worked out well and the crop looks great so far. Our Sonora germinated beautifully and is already a few inches high with no weeds in sight. Woohoo! The last stop of the day was at what we call the Barey orchard where we have a mix of Asian Pears & Pakistani Mulberries. Mulberry trees are quick growers and it is easy to see! These trees are only two years old and already have impressive size. Their branches are just starting to push buds and we’re hoping for a large enough crop this year to offer them as add-ons to CSA members so keep your eye out. We will keep you updated. All in all, it was a really beautiful day full of incredible greenery, blue skies and lots of learning.